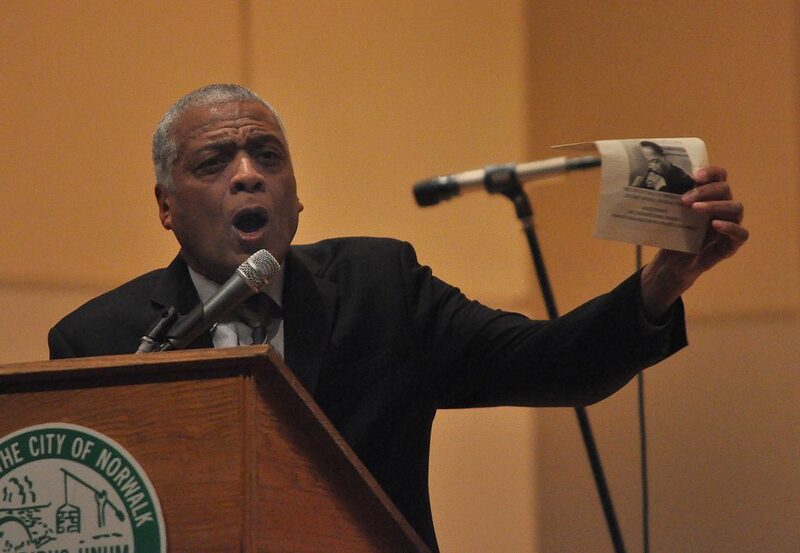 People’s Organization for Progress Chairman Lawrence Hamm speaks Monday in Norwalk, at the city-wide memorial observance of Martin Luther King Day. 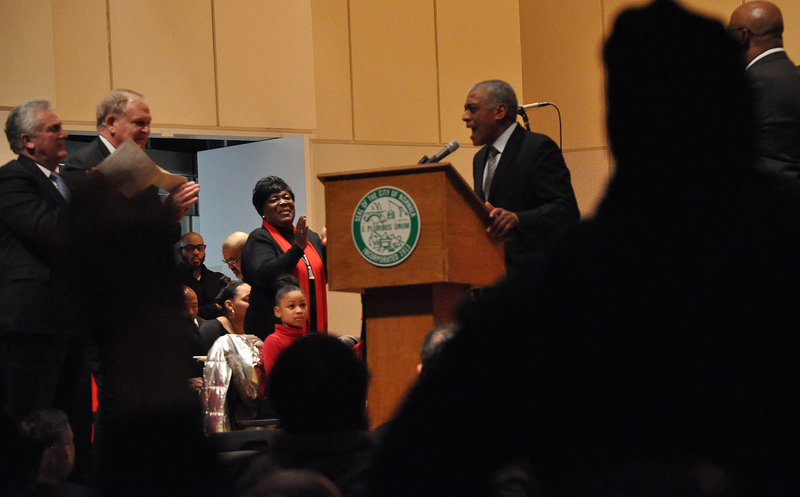 NORWALK, Conn. – A new civil rights movement is needed, Lawrence Hamm said Monday to more than 200 people assembled at City Hall for Norwalk’s annual Dr. Martin Luther King Jr. observance. Hamm, chairman of the New Jersey social justice group People’s Organization for Progress, delivered a fiery speech which reviewed civil rights history and the road ahead. “See, we all love Dr. King now. We all love him. He’s a great man for all of us now but some of you all wouldn’t have been caught dead with Dr. Martin Luther King in 1968,” Hamm said. 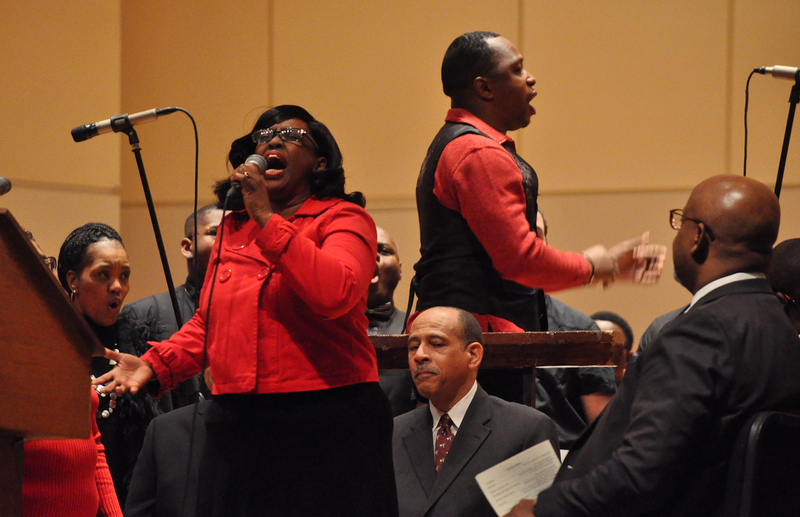 Simone Brown of Bridgeport delivers a spirited performance Monday in Norwalk. 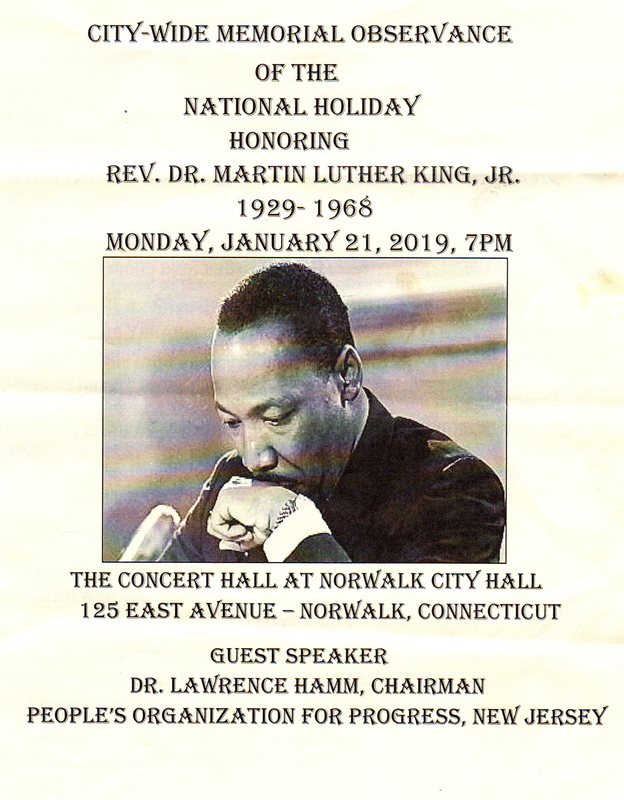 The program included spirited performances by the Martin Luther King Choir of Norwalk, which brought attendees to their feet multiple times. Hamm was the keynote speaker. The civil rights movement began “the day they started taking slaves from the African continent,” he said. The murder of 14-year-old Emmet Till in 1955 was “a dastardly crime,” and a catalyst for change, Hamm said. The Chicago boy had gone to visit family in Mississippi and been accused of flirting with a white woman, then beaten and shot in the head. Hamm said that he had also been sent to the South when he was a boy. “People don’t really understand the daily terror that black people lived under, in the South,” Hamm said. Amid modern fears of terrorism, black people have been “terrorized for 400 years,” he said. “The death of Emmet Till was the kindling that started the fire of civil rights,” he explained. Rosa Parks “was not just a tired seamstress” but a “secretary of the NAACP in Montgomery,” who famously refused to give up her seat on a segregated bus soon after attending a rally for Till, led by King. The program for Monday’s Martin Luther King Day observance at Norwalk City Hall. King didn’t have a lot of money, Hamm said. “America is a great nation but we can be a greater nation,” he said, advocating for redistribution of wealth and a a restructuring of the country’s social economic system. From left, Norwalk Mayor Harry Rilling and Norwalk Superintendent of Schools Steven Adamowski are among those standing Monday to applaud Lawrence Hamm, center right, in Concert Hall. What an excellent program. I’m glad I went. Dr. Hamm was quite moving.